Create classic, decadent pumpkin pie with this pure canned pumpkin. Packed with natural, wholesome pumpkin, this traditional filling will give your desserts a delightfully homemade taste reminiscent of pumpkin pies fresh from the farmers' market. With its delicious, seasonal flavor, this classic filling is made from fresh pumpkin that is cooked to perfection. Perfect for an endless variety of creations from classic pumpkin pies, cheesecakes, and breads, this filling comes ready-to-use right out of the can, making for fast, easy dessert preparation. Simply add it to your favorite dessert recipe, bake, and enjoy. Take this decadent pumpkin puree a step beyond the usual desserts by mixing it into a creamy pasta sauce, or adding a few scoops to your signature chili to create an unexpected treat that your guests won't soon forget! This pumpkin puree looks and tastes just like it should. I use it in all sorts of baked goodies and even in my hot seasonal drinks. The pumpkin is nice to work with and nice to have it in the quantity we need for a reasonable price. We have also found that we can save the cans for re-purposing in other areas in the shop. We specialize in homemade pet treats and find that incorporating pumpkin into many of our treats has been a success. Will be purchasing more in the future. Wonderful pumpkin taste. I eat 3c of canned pumpkin a day and also use pumpkin for our bakeries famous pumpkin scones and muffins that we offer year round. It was awesome to be able to order in bulk. I was hesitant to try an off brand pumpkin, but I honestly can say this tastes just as good if not better than other brands. Will be buying again. Not as orange as Libby's brand. But is still a decent product. It is definitely a great price when you need large quantities. However I would recommend Libby's brand over this one. Although we still use Libby's for our pumpkin pies and other items. This is a great choice to mix in for our pumpkin donuts and glazes. Not as vibrant as the Libby's however. Although much much cheaper. I was very happy with this product. The pumpkin taste great and it all works perfect for my homemade pumpkin bread and other fall deserts. This has a nicer color than some pumpkin purees I've seen and made delicious pumpkin bread! Great price, I will definitely order again for more pumpkin bread. I usually use libby brand canned pumpkin for my pies, rolls, and other baked goods. But I found this on here and thought I'd give it a try and wow. For the price and the quantity you get the quality is great! Its smooth and has a good flavor. I havent noticed any difference from this and the libbys other than maybe the color is a little duller. But once cooked it looks the same and tastes just as good. I recommend giving this one a try for the holidays! My pumpkin muffins turn out excellent when I use canned pumpkin. It is truly a delicious purée for cakes , cookies and pies. It gets everyone in the holiday spirit. I will admit I've never heard of this brand before. so on a whim, I purchased some to make pumpkin bars. I was looking to save a few bucks in the process. The results I got from this canned pumpkin where phenominal.. if your on a budget and looking for quality ,this product is it . A delicious pure canned pumpkin that is great for making pumpkin pies, pumpkin bread, and so much more. A great quality and the taste is perfect. I was skeptical about a off-brand pumpkin but it works just as good as any name brands. I will be buying again for thanksgiving baking! We bake a lot of pumpkin spice dog treats and Stella's pumpkin is the only brand we use. It has all natural and simple ingredients. Our customers trust the brand and love the flavor. Highly recommend! I bought this because most canned pumpkin in grocery store is not really pumpkin but a different type of squash. This tastes like real canned pumpkin and is really good in pie- will taste like you used fresh pumpkin. Most go for Libbys but we tried this to see if there was a big difference. And there isn't- we actually really liked this product. Great color- and taste. Would really suggest- for the price and the flavor. This pure canned pumpkin is perfect for any pumpkin flavored item. The pure itself is not sweet so if desired you may want to sweeten it, we tend to use this in our pumpkin pie smoothie. I have used this pure canned pumpkin puree in a ton of different recipes. Everyone always asked me what I made it with. It is now a favorite of mine. An excellent buy. Just as good if not better than the famous brand. Deep rich color, excellent flavor, This will make all your holiday treats at half the price of the higher cost brand. This is a great canned pumpkin product. I wanted to make pumpkin butter and pumpkin pancakes for the fall season. 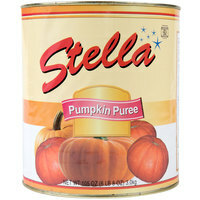 I got a few cans of Stella canned pumpkin and I am very pleased with the product. And pumpkin pancakes are a wonderful fall treat! This canned pumpkin has a good color and a nice consistency. Its smelled good when you opened it and it has a good flavor. We made pumpkin rolls, pumpkin pie and pumpkin apple bacon soup. All delicious. Love this canned pumpkin. It gives great flavor to our cupcakes and cookies, plus it is not to heavy to weigh down our baked goods. Great value for such a large can! Cheapest price I have found anywhere. Works great in pies, breads, muffins, etc. I am ordering more today and will definitely order more in the future! They warehouse team did a great job of packing this product. It was plastic wrapped with a lot of bubble wrap around the edges. Most of the cans were dented during shipment, but they were not punctured so it didn't affect the product. And, webstaurant store can't do anything about the product being dinged up during shipping, so 5 stars for the warehouse team. A wonderful value can of pumpkin that is really great. The pumpkin is not as seasoned a flavorful as some other brands, but it allows for you take your own approach to the filling. The pumpkin is a great texture and wonderful for pies. When we found the canned pumpkin we were very happy since Fall is right around the corner. This makes such a wonderful fall pizzas or pie. Great product! I came up with a recipe for pumpkin pudding and my residents love this so it works great for this. I also make pumpkin cake and bars with this product. Great for making any type of pumpkin desserts or recipes. I use this to make a mini pumpkin cheesecake and the flavor came out really well. This is my personal favorite! Who does not love pumpkin? We mix with other treats in the dogs Kongs and freeze them. They are handed out to all the dogs in the shelter daily. Great product, love the size of the can for the holiday season. Stores sell out fast & I'm extremely happy with the quality & speed of shipping! Great pumpkin purée. Tastes like straight up pumpkin. Used it for pumpkin pies and people loved it! Super cheap for a great tasting product! Order! For eight years now, our dog (a Black Lab) enjoys a dollop of pumpkin with each of her meals. As many pet owners know, pumpkin helps a dogs digestion and amazingly works to prevent both diarrhea and constipation. This product from China is quite good and we saw no reason to get the U.S. product for 50% more. This product is used to make our pumpkin donuts and pumpkin bread in my cafe. It has a great taste and the price cannot be beaten compared to pumpkin bought in stores. 100% pumpkin. Great product, great price. The pumpkin puree is a great texture and works the same as any other canned pumpkin I've used previously. This pumpkin is a great product. It's nice to be able to buy a large quantity at such a great price. Makes great pumpkin baked goods! At Sugarless deLite we bake pumpkin bread year round. We needed pumpkin and it was not available in our normal DFW channels. We were able to get this quickly and proved to be a good product. A little pricey and shipping was a killer but it worked for us. I feel this brand works better with my pumpkin bread than another name brand. The other brand found in the grocery store is sometimes gritty. When I use this brand, my bread never has a gritty texture. I love this canned pumpkin! You get such good quality for such a great price! This canned pumpkin is the way to go for anything that you need to do in larger quantities it bakes really well and like any canned pumpkin keeps everything moist I highly recommend this product! This time of the year we are always making different pumpkin flavored yogurt. Instead of using the smaller cans of pumpkin we decided it would be a much better idea of getting a bigger can of the pumpkin. It also makes the yogurt taste more of the real thing. I use a ton of pumpkin in my shop, and even more in the autumn months. This pumpkin is way, waaaay less expensive than in the store or from any other bulk retailer that I've used. It holds up very well in baking, and my pumpkin pies turn out perfectly. Very happy with this product, and really can't believe the price. Great buy! So excited to use this for pumpkin rolls, pumpkin muffins and pumpkin cupcakes! It is such a phenomenal price too! Can't wait to make pumpkin pie with this product! I found this pumpkin to be of high quality and it tastes great in pumpkin pancakes and pies. I also used it to make a pumpkin icing with no issues. The price is great as well, this costs a few dollars more at my local supply warehouse. Great value on the pure canned pumpkin. I am planning to make lots of pies and other goodies from this one can, and will probably buy more. Per the vet's suggestion, mix a couple tablespoons of pumpkin puree in his food. Not only did my dog love it, it helped settle his stomach. Nice pumpkin flavor and a really good value. I bought this to break down into smaller containers and freeze. This way, I have pumpkin anytime I want. A little dissapointed that the manufacturing date was almost two years ago. I know it lasts a long time...but it should be fresher than that in the event we don't need to open it soon. This is our 3rd time purchasing this product from WEBstaurant. The shipping is fast, quality is good and any questions we have have always been responded to quickly. We use this product as a topper on our dogs food daily. They like it and it keeps them looking nice. We also make dog biscuits with it. Great tasting pumpkin flavor. I made cheesecake pumpkin with this product and it was a great success. The price is affordable and will definitely repurchase. This is a can of smooth, pure pumpkin. It's ready to be spiced up and baked into a million different pumpkin goodies. A decent brand/quality of canned pumpkin- we had no issues with it. Great Product! It always smells wonderful when I open the cans and from can to can the consistency is the same, a nice puree of pumpkin. We love this canned pumpkin, it added a great flavor to our pumpkin smoothies. easy to use. easy to store. also can buy just 1 can to try. That's what we did. Loved it so much got a whole case. This large can of pumpkin is flavorful and great for all sorts of uses! I personally love adding some spices and cream to create a delicious base for the perfect pumpkin ice cream!! I think what is great about this product is that its natural. I enjoy being able to say that about a canned product. It has great pumpkin flavor that we use in the fall to make pumpkin mousse. Absolutely delicious! I bought a couple of cans for my fall inspired cupcakes and they came out wonderful! I am more than satisfied with this purchase! I have been busy getting my breads and cookies and pies ready for Thanks Giving. I know this large can will give me enough to get the job done. the Quality is very good I am able to have enough packed pumpkin to make all my desserts. And when I make the pumpkin cookies I put maple icing that adds that fall taste. I make pumpkin pecan pies YUM. This is a really great product! It has a great fresh pumpkin flavor. The price is also great. It is a wonderful product for baking. Perfect puree to make pumpkin pies, muffins, ice cream, and cakes. It's great for the Thanksgiving season and is the best quality around and can be stored in the fridge for a few days. The 100% Pure canned Pumpkin sold 6 10# cans per case. Works great for those pumpkin pies, and cakes. We love the flovor makes it easier to prepare. These was a huge can of Pure pumpkin. I was able to use this for cakes, pies, cookies and cheesecake for the holidays. It really came in handy i will order more. i make alot of pumkin pie's and this taste just as good as any other brand to me.As long as people keep ordering i will keep using this. This pure canned pumkin taste so good. we sell alot of pies as specials and its hard to keep enough made. Great product! Great price! I'm sold and you will be to. This pumpkin filling is great! Not only is it useful for pies but other danishes and quick desserts too! Easy to change it in to a delightful treat! This Pure Canned Pumpkin makes some really great pie. I love pumpkin pie anytime of the year and this is exactly what we use. Our customers go crazy for our pumpkin pies during the fall. this is a great product. my family use it every day.It is sweet but not too sweet.I would love to recommend this product to my friends. We love this pie filling so much so that we won't use anything else! This time of year, around Halloween and Thanksgiving we can't keep our pumpkin pie on the shelves. For this quantity, this price is also unbeatable! I really enjoy this product. It has a great flavor. It is sweet but not too sweet. The price is also fantastic for what you're getting. 100% Pure Canned Pumpkin. Perfect for those Pumpkin desserts.Pumpkin Pie, Pumpkin cookie's.No matter what time of the year it is people love their pumpkin.This one has avery goog texture for mixing. I like this pumpkin puree because there are a lot of different spices you can add to make it your own. I've made many pumpkin pies and quickbreads that came out great using this stuff. Great Product ! I use this for all of our baked goods, such as Pumpkin Bread , Pumpkin Bread suffle , and of course Pumkin Pie. Tastes fresh even though it is canned. Would recomend ! Great tasting pumpkin! When we first bought this product, we were not sure what to think of it because it was the first time that we had ordered canned pumpkin online, but we absolutely love the taste of this! We will never go back to what we used before! Excellent product. Very consistent quality. We give our 3 dogs canned pumpkin twice a day with their normal food. We go through the cans pretty fast and buying the #10 cans is much cheaper than buying the smaller cans in store. The pumpkin crop didn't fare well this year and it's been nearly impossible to find canned pumpkin in the stores. I was thrilled to find a good supply at a good price on this site.